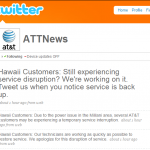 AT&T’s cellular network in Honolulu failed this morning, disconnecting thousands of customers for at least six hours. 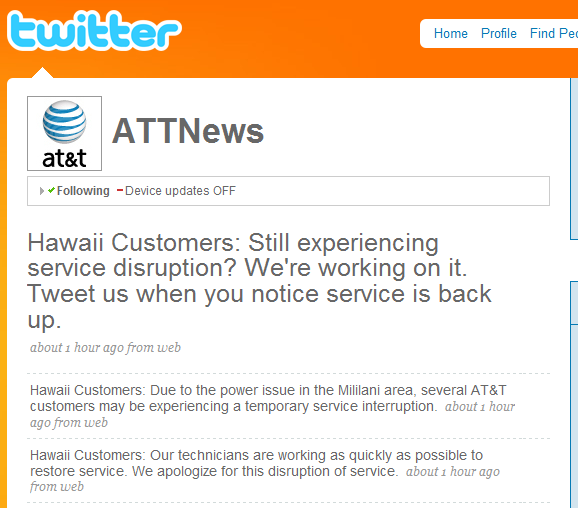 (As I type this, service is restored in some areas, like downtown, but not in Mililani.) At first I thought I just missed a bill payment, but it didn’t take long to realize it was a significant service outage. Local users of the Twitter service were chattering and griping about their dead cell phones and iPhones. Journalist Fernando Pizarro noticed that AT&T had a Twitter account: @ATTNews. He directed a message at the account, and others followed suit. But it became clear that the AT&T Twitter account was being used largely to post links to news releases, much to the frustration of customers who expected a response. Ultimately, it looks like the largely one-way, press-release driven AT&T Twitter account not only “woke up” and became responsive, but went a step further to ask customers for updates — all within a couple of hours. Of course, KGMB and KITV, also active on Twitter, were part of the conversation as well. As their newsrooms got updates from their own AT&T contacts, they instantly passed the information along. Twitter users were thus among the first to know that the system should be back up by 1 p.m., and that customer service would give one-day service credits ($3 to $25) upon request. Go Honolulu Tweets! I wonder if the outage was linked to the power outage Central Oahu experienced last evening? Newsies like me can count on Twitter Friends for instantaneous situational awareness. Will there be a story in print? Ryan: I’m going to post this on my Facebook profile, LinkedIn, and retweet your message! This should be required reading for any company that ventures into social media thinking it’s only a one-way street. Thanks for the mention. It was great fun participating in an exercise of Twitter power! If any one knows blogs that refer AT&T, and these questions; the type of “best practices” or productivity improvement projects that are actually being installed, the estimated cost of such projects, and their completion times. Please respond. Completely agree, that’s why I referenced this story in a recent blog post. It’ll be interesting to see if AT&T will use more two-way Twitter power in the near future. The @ATTNews link in the article actually goes to @fpizarro’s twitter page, just FYI.